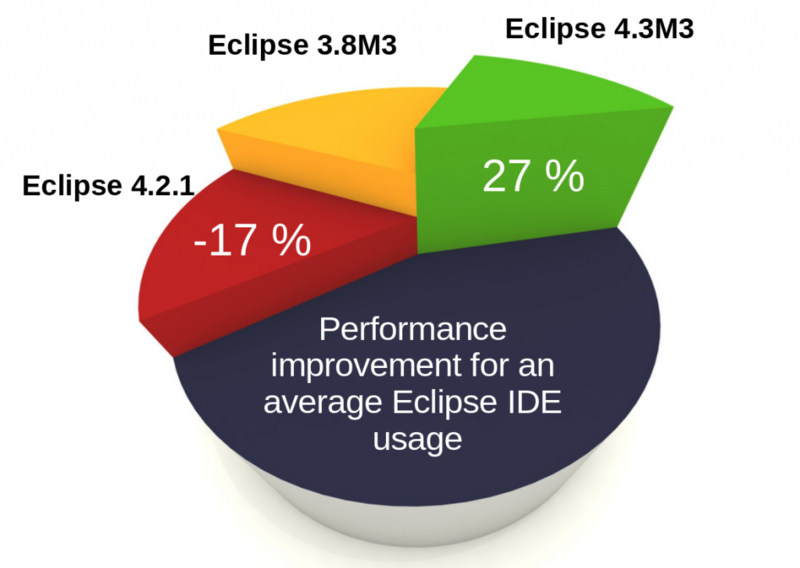 I just downloaded the Eclipse 4.3 integration build and I’m stunned by its performance improvements. You find the currently download for the Eclipse 4.3M3 build under the following link: Eclipse downloads. I selected I20121113-0800. I measured the performance improvements and here are the results visualized as a nice graphic. But the integration build feels much faster to me. I think the main change was done in Bug 391868. Also Mylyn seems to have solved there performance issues in Bug report in their latest build, so for me the Eclipse IDE is lightening fast again. I suggest you download the latest build and test it. Please report additional performance problems in the platform via Eclipse platform bug, if possible with a pre-analysis of the performance problem. > I should properly add that I made the above numbers completely up. It sure would be nice if they port those changes to the 4.2.2 (Juno SR2) branch so the “average user” doesn’t have to wait until June to experience the benefits. Kudos to the platform/ui/runtime team and any other who contributed. @Eric: It is planned to provide the improvements via Eclipse 4.2.2 and it might also be possible to provide a feature patch for Eclipse 4.2.1 (see Bug report 391868). Eric, most of these fixes *have* been made in the 4.2.2 branch. I’m currently running last night’s maintenance build and am very happy with the results! im sorry but im new to your page, and have no idea what the term “integration build” means. what has been integrated into this build? @Tomas: Go to the download page I give in the post and look for “Integration build”. Thanks for update. Will try. Anyway the graphics looks cool. What is the name of the tool for generating these graphs? I should probably add that I made the above numbers completely up.